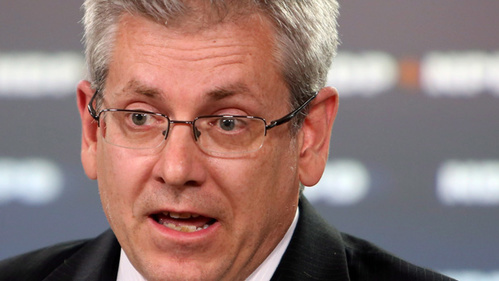 CBC.ca PlayerNew Democrat Charlie Angus reacts to Wednesday's testimony at Mike Duffy's fraud trial. Neubauer moves back to the Deloitte report. Wright didn't engage with Duffy on the final amount he owed. Wright was trying to find out about Tkachuk's talks with Deloitte on removing Duffy from the process. The confusion lasted until March 21, says Wright. Deloitte said it was their mandate to look into t and they would continue. Wright accepted that and didn't push back but felt they should tell Duffy's lawyer. We are shown deloitte's statement of work from March 7 and 8. Wright was content the work of Deloitte was limited to the issue of primary and secondary residence and felt that Duffy had dealt with that already. On March 21 there is news from Gerstein who had spoken to Deloitte. He said any repayments by Duffy will not affect their conclusions because they were looking at residency. But they couldn't conclude because they had not gotten cooperation from Duffy. Wright then called Duffy's lawyer (with Perrin) to persuade her to continue with the rest of their agreement (ie Duffy repaying the money, which he had not yet done) even though they couldn't get Duffy out of the Deloitte process. Wright would send a cheque to Duffy's lawyer in escrow until Duffy had repaid the same amount to the Receiver General. Wright says it was clear it was his own money. We are now on lunch break. There seemed to be more concern about "media lines" and staying on the same message than the actual truth of the Duffy expenses. Seems like it was a very cohesive plot until someone discovered the $90,000. Then of course, the sh..hit the fan and we are now here in court. Lubricious to think the PM did not know. It's peanuts in the grand scheme if things....but they got caught and the even peanuts matter....where $billions don't. And after the PM was prepared to accept the media spin, he stuck his fingers in his ears and went "la la la I can't hear you!" Sorry my wee balogna meter just beeped. There's a lot of emphasis on media lines. Oh what a tangled web we weave when first we practice to deceive. So According to Wright: PM willing to turn a blind eye to possible criminal activity by his con senators and "good to go" with Wright and Tkachuk's cover-up plan to make this go away. Mr. Wright is too decent of a man to be in politics. I guess the rich are different from you and me! Now I understand! Because the bribe didn't affect Wright's standard of living, it wasn't a bribe. Thanks for that! April 30, 2014; RCMP Commissioner Bob Paulson says it “shouldn’t be very long” before the public finds out why Mounties didn’t lay criminal charges against Nigel Wright for bribing Senator Mike Duffy. Paulson says the force has documented “very precisely” why they didn’t charge Wright. Wright's testimony so far makes it clear that he, the PMO and Conservatives controlling the senate board were actively involved in a cover-up. Nigel Wright leaves the courthouse during the lunch break. Cannot concude PM didnt know - only that the topic was not discussed. It looks like Duffy really strung along everyone on this thing. When someone says "$90,000 has no impact on my net worth" we know we are ruled by elites. How can ANY of these people we elect or appoint have any clue what the overwhelming majority of Canadians think or live like. I have no sympathy nor respect for Mr. Wright. He's just another one of the ruling elite we stupidly put in power. 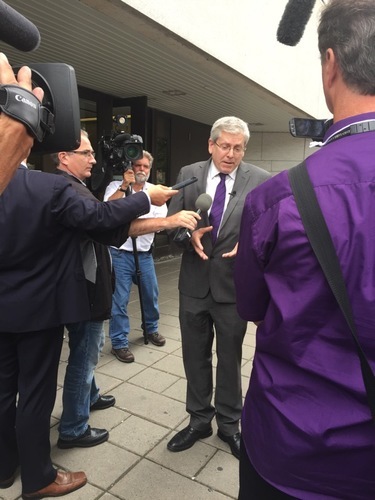 NDP MP Charlie Angus is speaking outside the courthouse. 'The real question is when is Harper going to explain himself?What kind of work place is it that he has everyone involved in this deal? And yet were told the only thing there pm was consulted over is media lines. It is obvious that the whole plan between Lebreton, Tkachuk, Gerstein and Wright,, before the Deloitte report came out was to protect the Conservative name and make the issue quietly go away. They've been caught red-handed.. It is obvious that there was a plan between Gerstein, Tkatchuk, LeBreton and Wright was to protect the Conservative name, not the Cdn taxpayer.